Lewis writes frequently about longing and the experiences that triggered it for him. These are not simply the longing for earthly pleasures, but nameless, unidentifiable and intense experiences of longing that could be triggered by just about anything. Lewis describes how these longings were triggered by a tiny garden his brother had built on the lid of a biscuit tin, Norse myth, Beatrix Potter's Squirrel Nutkin, works of poetry and certain illustrations in books. He identifies these experiences as joy. Lewis later understands that we must not confuse the longings with what the longings actually point to. All our intense desires or joys are not longings to get back to a particular thing itself, but are merely the vehicle or conduit for some object beyond. Lewis eventually understands this object to be God. In my own life I have certainly confused longings with what the longings pointed to. The scent of certain flowers brings back memories of childhood and with them the desire to go back and recapture those feelings, those experiences. But Lewis says that if we could go back, even what we were feeling then would simply be a memory of something even more distant. Because we are made for another world, all our lives we have desires which this world cannot fulfill. Our task is to understand that these experiences actually point to our desire for God and not to make idols of them that will never satisfy us. Our reason and imagination both work together to give us a fuller understanding of truth and reality. For the first half of Lewis's life, these two parts of his mind were sharply divided. He understood the world through his reason alone, even though his imagination was perhaps the more vital entity. He believed that the life of the imagination, which he loved, was simply imaginary. Everything he believed to be real he saw as meaningless. Only once he converted to Christianity did he find that the two parts of his mind were reconciled in Christ and that the imaginative part could provide an additional understanding of truth that reason alone could not. From the time we are children, we are trained for the most part to believe that the imagination is simply "make believe." Lewis suggests that our task is to wake up to a fuller understanding and experience of the imagination as a vehicle about the true nature of reality and God. As a materialist, Lewis prided himself on the blind acceptance of the current intellectual climate and a rejection of everything in the past. Lewis's friend Owen Barfield helped him to understand that just because a particular model or worldview was held hundreds of years ago doesn't mean that it is obsolete now and cannot influence or teach us. One must discover why a model or position is no longer held. Many of the climates in the past could provide truth, but were lost to the future simply because they went out of fashion. Lewis calls this chronological snobbery. We must always be willing to ask questions before making any judgments about the past and its ways of understanding the world. Our current model will likely be ridiculed and dismissed by people 200 years from now. This doesn't mean it has no value. In order to effectively describe his experience, Lewis categorized the imagination, dividing it into three parts. 1. Reverie, Day Dream, Wish-Fulfilling Fantasy. This is the type of imagination where we think of ourself as the hero of some drama we create, or of how our world would be if we were unimaginable beautiful. It is focused on the self. Lewis beautifully illustrates this in The Voyage of the Dawn Treader, when Lucy is looking through the magician's book of spells and comes on a spell "to make one beautiful beyond the lot of mortals." 2. Invention. Things we create in which we do not play a part. Lewis's creation of animal land was an example. He criticizes his own creation of animal land for not having any poetry or romance. This does not mean that this distinction cannot contain romance. 3. Experiences of Joy. Lewis views this as the highest distinction of imagination. It is the experience of longing, what Lewis call sehnsucht, associated with an object we can never possess in this world. It might also be translated as "intensely missing," or "unsatisfied desire." It is the experience described in the first point at the beginning of this post. While we cannot will experiences of joy to happen, we can appreciate distinctions of the imagination and engage in those that are beneficial and avoid those that are negative and harmful. Lewis had initially been educated through a study of the classics, that is, the great literature of the ancient world. Even prior to his conversion to Christianity, when he later began to read English literature, he describes how among all the writers he read, only the Christian writers such as John Donne, George Herbert, Thomas Browne, Samuel Johnson, John Milton, and Edmund Spenser wrote material which contained depth and could be trusted. The writings of George Bernard Shaw, Voltaire and others, Lewis called "tinny," thin and too simple. "The roughness and density of life did not appear in their books," Lewis writes. What did he mean by this? I understand it to mean that these writers simply did not account for the way life is actually lived by human beings with all the attendant emotions, fears, desires, hopes, sorrows, joys etc. The Christian authors wrote about the full range of human experience. Why should we care about this? Because the roughness and density of life doesn't shy away from ambiguity or complexity. It doesn't hold up one perspective as the be all and end all. It allows for other perspectives and new insights. It looks at the world through the eyes of others, not simply through the eyes of the world as it is for me. It doesn't turn away from the evil or the ugly, but neither does it glorify it. It provides a balanced approach to understanding and living life. Interested in learning more about C.S. Lewis's imagination? Why not download two free chapters from my book The Surprising Imagination of C.S. Lewis? Simply click on the image below to download now. 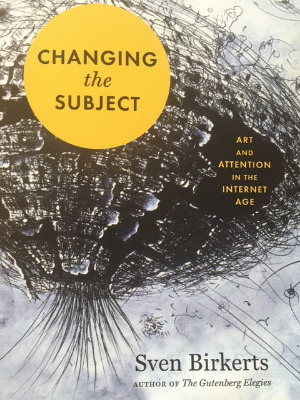 I'm working my way through Sven Birkerts's newest book, Changing the Subject. It's a masterful plea to think about the ways digital technologies are eroding our abilities as humans, particularly how it affects and displaces imagination. There's one line I've been intrigued with ever since I read it. Birkerts writes a chapter in defense of idleness, not idleness as we would define it today, charged as it is with the aroma of the ne'er-do-well. But idleness that seeks not to achieve anything, but to simply be, to let the mind drift and wander. "Idleness is the mother of possibility," writes Birkerts. I have a friend who shared with me a strategy for jumpstarting the creative process. He calls it "intentional nonlinear search." One begins with something that piques the interest and then proceeds by way of serendipity. One book leads to another; a conversation leads to an exploration, and so forth. The goal is simply to drift, to let whim pull you where it will. There is no other goal; one does not know where one will end up. And Birkerts affirms this. But the question must be asked: is such a way of being still possible in our frenzied yet concomitantly enervated culture? Have we gone too far, passed some watershed beyond which there is no returning? Copyright 2019 Mark E. Neal. All Rights Reserved.